There is something particularly delicious to me about the single dish meal. I like to build the flavors to make the perfect burst of flavor in your mouth. This does require a fair amount of tasting as the dish is prepared, but that’s ok with me! For this dish, I started out by rooting around in the refrigerator and cupboards. I was in the mood for something fresh, but not raw. Sometimes, the best thing is a compromise (really!). So, here you have some thoroughly cooked lentils, celery and onions combined with barely warmed cherry tomatoes, snow peas and arugula. 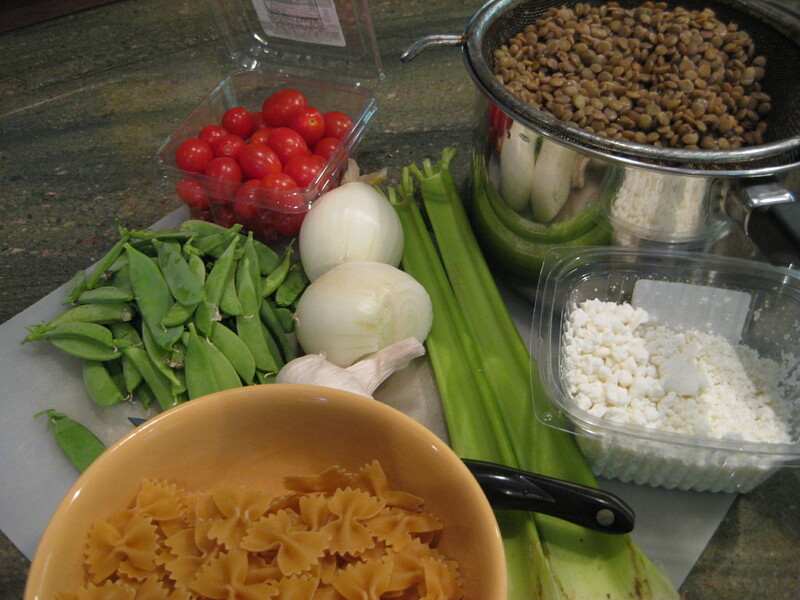 Cook the pasta and lentils in separate pots while you prepare the rest. 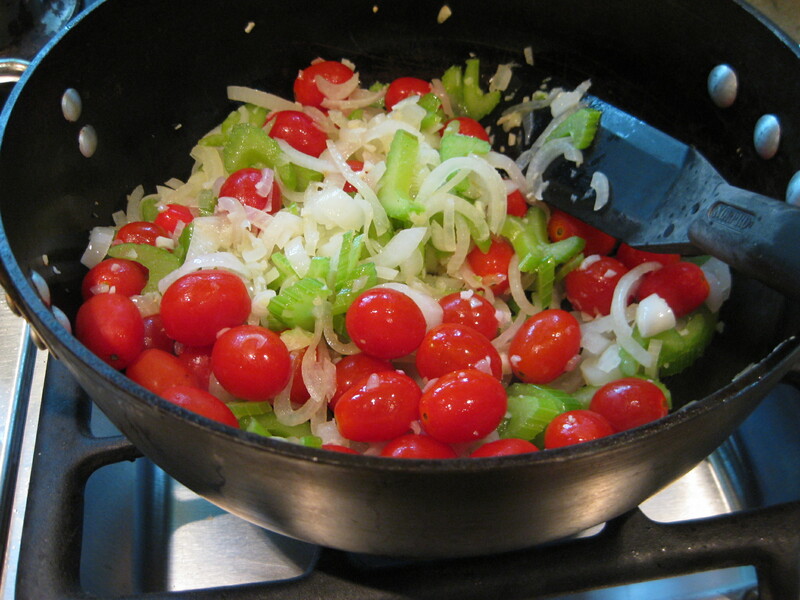 Sauté the garlic, onions and celery in olive oil until the onion is translucent, not browned. The idea here is light and fresh tastes and overcooking will change that flavor. The celery should still have some crunch. Then add the snow peas and cherry tomatoes and warm through. Once the snow peas have turned bright green, you’re done! 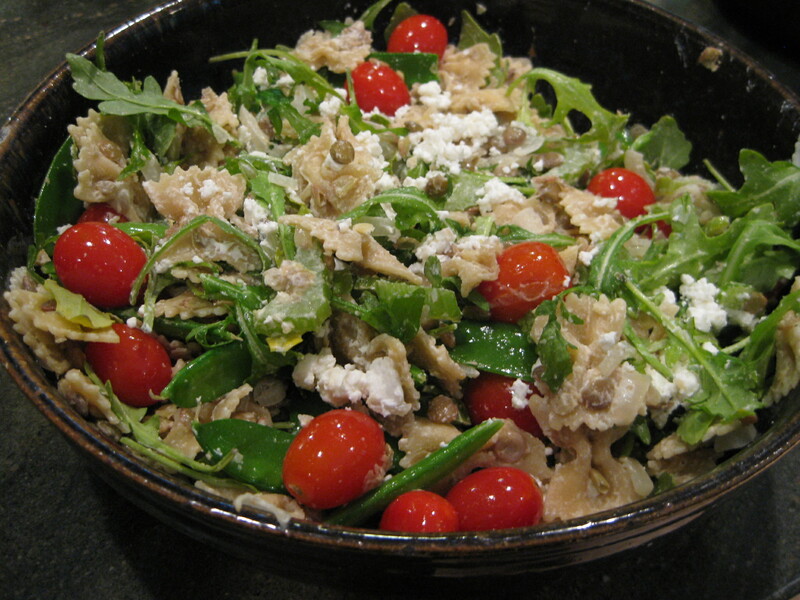 Finish by stirring in the pasta, lentils and arugula. Sprinkle with goat cheese for serving. Your guests may enjoy having a dish of goat cheese on the table so they can add more, if desired. And of course, if there are any vegans, definitely leave it on the side! I didn’t add salt or pepper during the cooking this time and left it to the individual to season as desired. I really love this dish! It has so many wonderful elements – the pasta (which can be whole grain or gluten-free), the lentils (for protein), the vegetables (for obvious reasons) and the goat cheese add a creamy flavor. I hope you enjoy it!